The Publishers Associaton of the Phils, Inc. (PAPI) Natonal President Nelson Santos (center) togetherwith Department of Science and Technology headed by Sec. Fortunato T. de la Peña with DOST-NCRRegional Director Jose “Jojo’ Patalinjug III and PAPI Chairman Emeritus Johnny Dayang. 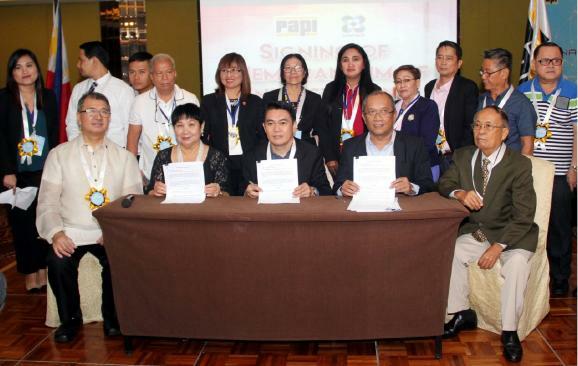 MANILA – The recently concluded 23rd National Press Congress bythe Publishers Association of the Philippines, Inc. (PAPI), held at the BayleafHotel, Intramuros, Manila has highlighted community development throughenhanced public awareness on science and technology. The annual event is mandated under Presidential Proclamation 1187 whichdeclared December every year as the Month of the Community Press in the Serviceof the Nation, and designed PAPI as lead agency for its observance. The23rd National Press Congress edition was held in collaboration with the NationalCapital Regional office of the Department of Science and Technology (DOST-NCR). DOST Secretary Fortunato de la Peña, who keynoted the press congress, also notedthe theme’s clear message. “I appreciate that you have chosen the role of scienceand technology as prime movers of developmental growth for this year overalltheme,” he said and emphasisized the importance of Press Freedom and value ofcommunication and connections. “We stand to benefit tremendously fromcollaboration in sharing knowledge for the greater good,” he added. PAPI Chairman emeritus Johnny P. Dayang, acknowledged previous PAPIpresident Louie Areola who formally introduced Sec. Dela Pena, and incumbentpresident Nelson Santos for all their efforts to make their organization responsiveto current development demands. “The information service of our people isdependent on our community press; we are the vanguard of press freedom as wedeliver the right information to the grassroots,” he said. Other highlights of the annual PAPI media event were the update by PCOOUndersecretary Joel M. Sy Egco, executive director of the Presidential Task Forceon Media Security (PTFoMS) on related to the 2009 Maguindanao Massacre andrelated media killings and security, and the Senatoriables’ Forum. At least 10 senatorial candidates participated in the Forum including DLSU lawdean Chel Diokno, former DILG Sec. Rafael Alunan, noted election lawyerRomulo Macalintal and Magdalo partylist Rep. Gary Alejano, former Presidentialspokesman Harry Roque, Profs. Toti Casino and Rizalito David, and lawyers Larry Gadon and Dan Roleta.